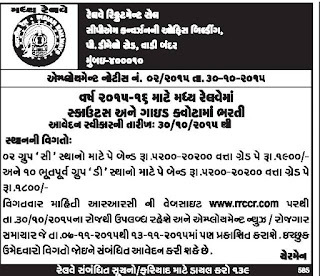 Railway Recruitment Cell Central Railway has published a Advertisement for below mentioned Posts 2015. Check below for more details. Passed 10 + 02 or its equivalent examination with not less than 50% marks in the aggregate from a recognised Board. 50% marks are not required for SC/ST/Ex-servicemen or where the candidates possess higher qualification i.e. Graduation/Post Graduation etc from a Recognised University. 10th passed OR ITI (in trades approved by the NCVT) OR Equivalent from the recognised Educational Board. 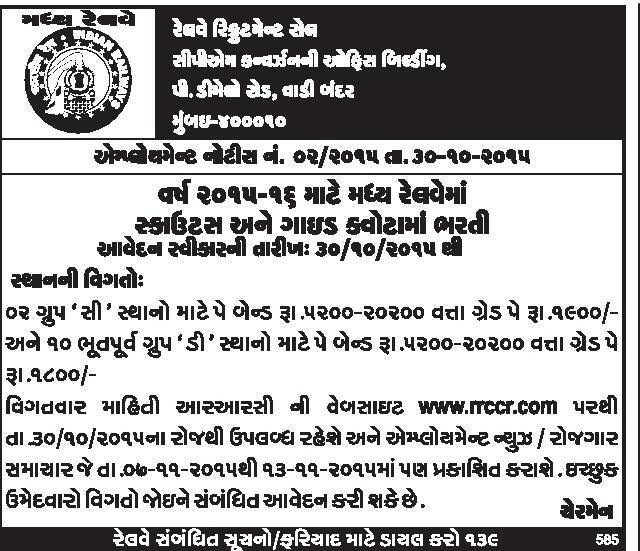 Exam Fees : The examination fee for Unreserved and OBC candidates is Rs.100/-. The examination fee should be paid in the form of Indian Postal Order (IPO) from any Post Office, drawn in favour of and payable at Mumbai as follows. Senior Personnel Officer (Recruitment), Central Railway, Mumbai. SC/ST candidates, Ex-Servicemen, Women Candidates, Persons with Disabilities, Minority candidates*, and candidates belonging to Economically Backward Classes are exempted from payment of examination fees. Senior Personnel Officer (Recruitment), Chief Personnel Officer’s Office, General Manager’s Office Building, Mumbai-400 001..